There is truly no place like India. It is filled with culture and color, making it an unforgettable place to visit. However, it is quite clear that the country is overpopulated and underdeveloped. Politicians are corrupt: They work for the money instead of the people, creating a lack of successful urban planning. The streets are riddled with beggars and children often tap on car windows begging for food while we’re stopped in traffic. They don’t go quickly. Instead, they continuously tap on the glass and motion to their mouths with their hands. It’s heartbreaking to see starving children, but I can’t seem to look away. It’s one of the hardest things I’ve ever done to turn my back on a starving child, and I’d feed them all if I could. Nonetheless, the people are beautiful. Even with much influence from the western world, women still wear brightly colored saris. Women still sit in the streets stringing garlands of jasmine to wear in your hair. The smell helps to overcome the constant smell of pollution. As I’ve grown up in the western world I’m not accustomed to wearing Indian clothes, but one of the first places I go is to FabIndia to buy a salwar kameez, a combination of a long shirt and pants. I absolutely adore Indian fashion. There are no crosswalks in India. People run into traffic when the chances of them dying are at their smallest and hope that nothing happens. I’d like to say that traffic is calm, but it’s quite the opposite. There are approximately 1.3 billion people living in India. The country is roughly twice the size of Alaska but 1,000 times the population per square mile, and the traffic reflects that clearly. A combination of cars, rickshaws, trucks, and countless scooters flood the streets. Oftentimes a rickshaw meant for four people carries eight or even nine people, and scooters meant for two and maybe three carry entire families. In the pouring rain a family of five—parents with three small children—swerve around on a tiny scooter. In the blink of an eye they could all be lost, but they don’t seem to be worried. Drivers drive quickly, wanting to get from point A to point B without getting stuck behind slow trucks, which there are many of. To go around the trucks they move into the opposite lane of traffic, only to move back seconds before a head on collision. This causes a great deal of accidents and a great number of deaths. However, it’s normal to the entire population of India, and they’re far from straying from their ways. In wild traffic, where cows are just as active as cars and there is a large population of goats, we find ourselves in Mathura, the birthplace of Lord Krishna. He was said to be born in a jail in Mathura whilst his mother was imprisoned by her brother. Today, a temple stands in his honor, a popular tourist attraction for the Hindus of India. The second our driver parks we’re swarmed by young men who are ready to bargain their way into being our tour guide. The sign on the car that says “tourist vehicle” gives us away. Some want to sell us some trinket and others are beggars. About ten young men swarm our car, making me question whether I want to get out. I clutch the door handle as I gather the courage to exit. What I’m not quite prepared for is the staring. My mother used to talk about how everyone stared at her and how she hated it, but when I was younger I was oblivious to everything going on around me so I didn’t notice. However, now that I’m older I notice how everyone stares at me. I completely understand why I’d be stared at, I’m the only person in a sea of people not wearing Indian clothing. The way I’m dressed sets me apart and I can’t blend in. The closer we get to the temple, the worse it gets. I stick out like a sore thumb or, literally, the American girl in the heart of India. I can’t stay in the temple for long, my shoulders aren’t covered, which causes many dirty looks. I’m uncomfortable, ashamed even, and as much as I want to fit in, I can’t. I crack jokes; I quote Eminem by saying, “it’s like they’ve never seen a white person before” and I often say “don’t break your neck” when men, women, even children strain their necks to get a good look at me. I try my very hardest to make light of the situation, but I really want to leave. Eventually we leave, but we still have to get through all of the merchants to get to the car. Indians are a very persistent people, from my family insisting that I have another dosa to people trying to sell me something, they never go down without a fight. Although there are many problems with poverty and urban development, India has many amazing sights to see. In Uttar Pradesh there is a town called Agra, the home of the Taj Mahal. Going to the Taj Mahal is like meeting a celebrity; I’d seen pictures, but I’d never expected to really see it in all its glory. At 4:30 we woke up, got ready, and headed to the Taj Mahal while it was still dark. I was tired, groggy, and hungry. Nonetheless, as we entered the Eastern gate I could see the Taj, the while marble glowing in the rising sun. I’d expected the Taj Mahal to be amazing, but as I approached the first arch, where I could see a full view of the Taj, I was absolutely speechless. There it stood, in at its beauty. 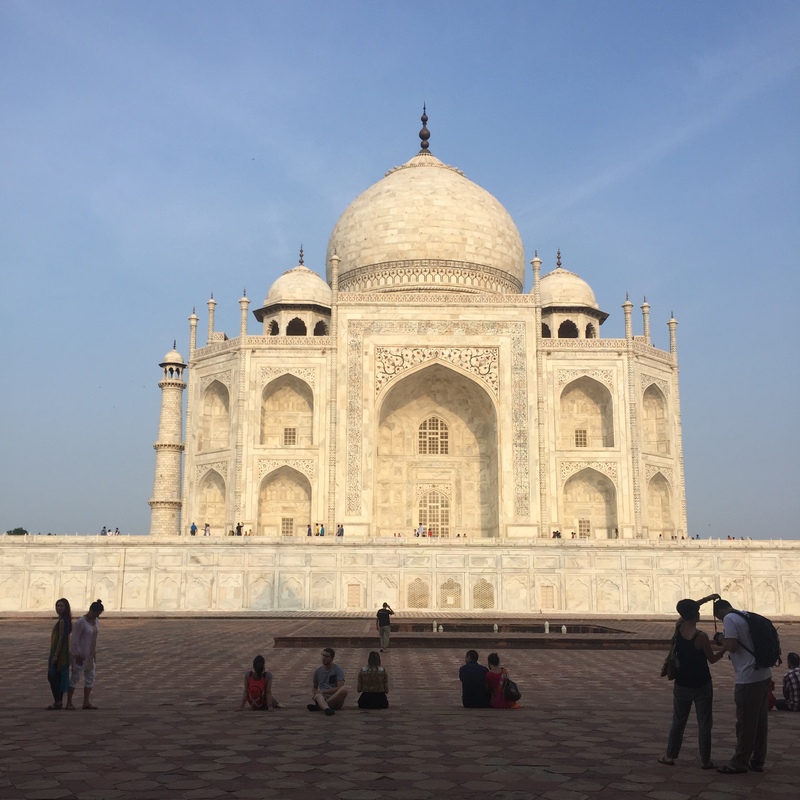 I couldn’t believe that I’d really made it halfway around the world and to the Taj Mahal. That same day we left Agra and headed to Jaipur, Rajasthan. Even in the busy city, cows still wandered the streets. They sat in the middle of the roads to keep away from pesky flies. During out first full day in Jaipur we visited the Amber Palace. We arrived at the palace in style, atop a giant elephant. During the elephant ride merchants yelled up to us trying to make a deal and I couldn’t understand how it was possible to actually make a transaction. At the top of the hill stood the 500-year-old palace still as ravishing as ever. I didn’t know that we would visit the palace, I’d never even heard of it, but it turned out to be a hidden treasure. From the various chambers of the castle we could see the city of Jaipur for miles and miles. From other rooms we could see miles and miles of open hills where the only manmade object was a large wall that surrounded the castle. The Amber Palace had been a home for the royal family of Jaipur and it was quite clearly fit for royalty. The architecture and designs left me in awe. 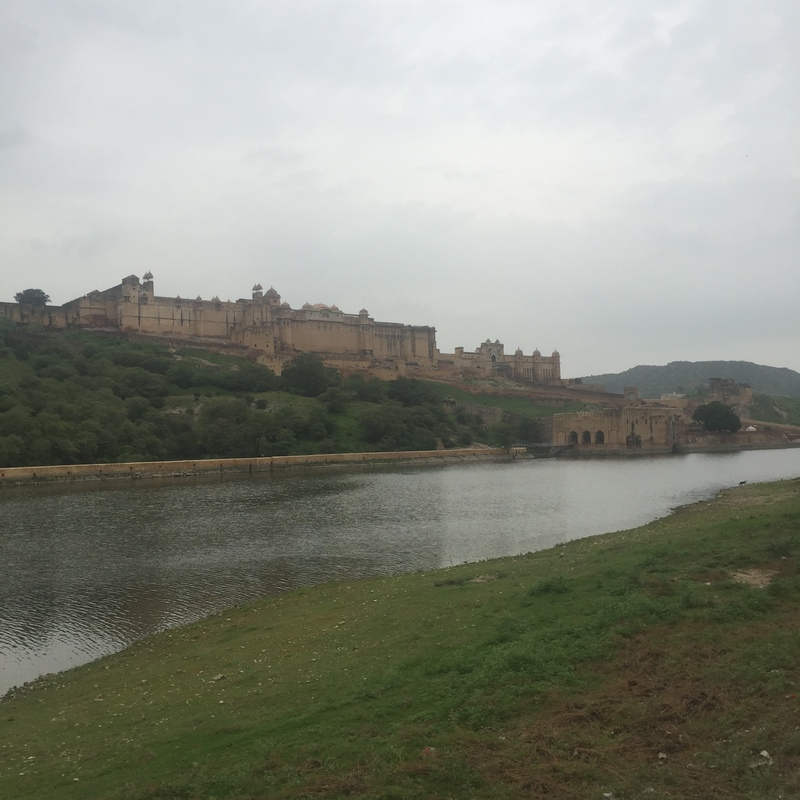 As I looked out over Jaipur I felt an overwhelming sense of love for India, the place that I call my motherland, the place where I’m incredibly proud to be from. After all of the incredible sightseeing it was time for the real vacation spot, Goa. I fell in love with Goa the first time I saw Bride and Prejudice. The main character in that movie, Lalita, played by none other than the beautiful Aishwarya Rai, goes to Goa and stays in a swanky resort. At night she goes to the beach where Ashanti is conveniently having a concert. She splashes in the water as she flirts with some guy she just met. It’s all very glamorous, very over the top, and definitely very Bollywood. Of course, I absolutely loved it, I still do. August is the rainy season and there are at least three torrential downpours a day, but when the sun does come out it’s a sight to see. The sun shines over the water and brightens up the entire resort, quickly tanning me as I sunbathe. However, resorts aren’t the only thing Goa has to offer. 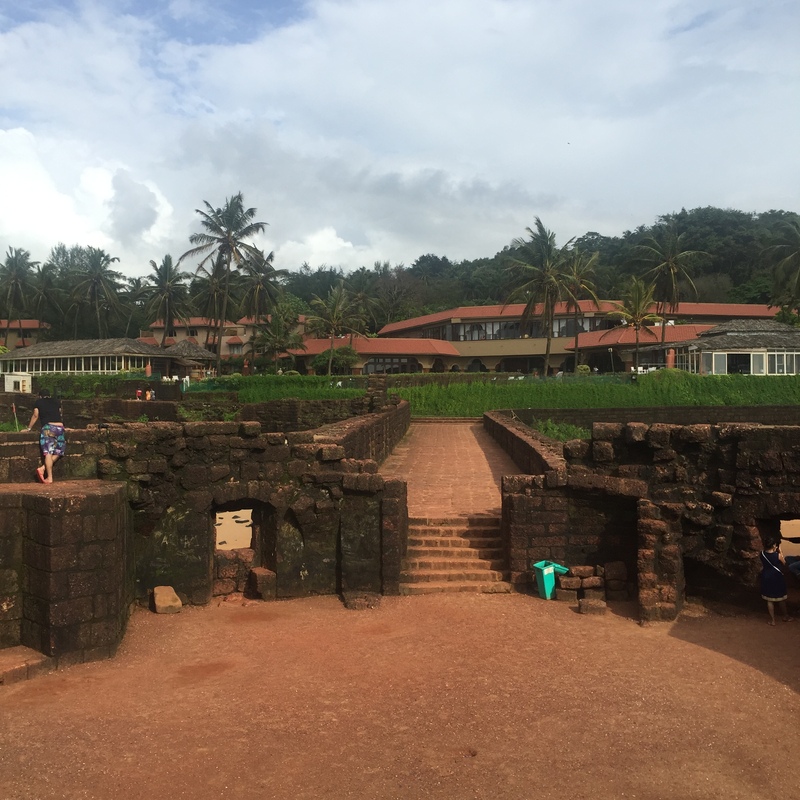 Beyond the walls of our resort are beautiful temples and churches from the time when Portugal occupied Goa. There is an adorable spice plantation that grows almost any spice you can name. It’s like the movie: glamorous, over the top, but sadly it’s not a Bollywood movie. When I talk to my friends and they ask how India is I tell them that it’s crazy, it’s vibrant, it’s beautiful, and there’s really no place like it. And as much as I miss everyone back home, I know that I’ll long for the busy streets and the colorful saris once I’m home. I’m incredibly proud to be Indian and I’ll surely flaunt it once I’m back home with henna that goes up my arm and all of my new salwar kameezes. I’ll speak of India endlessly and talk about my trip to anyone who will listen. I’ll miss my idli and dosa for breakfast and my curry for dinner. It’s just not the same back home. India is a beautiful country, and just like with any place, with the bad comes the good. It’s a blessing to be able to experience such a place. Next Old Is the New New: The Surprising Rise of Bernie Sanders and Jeremy Corbyn by Sam C.